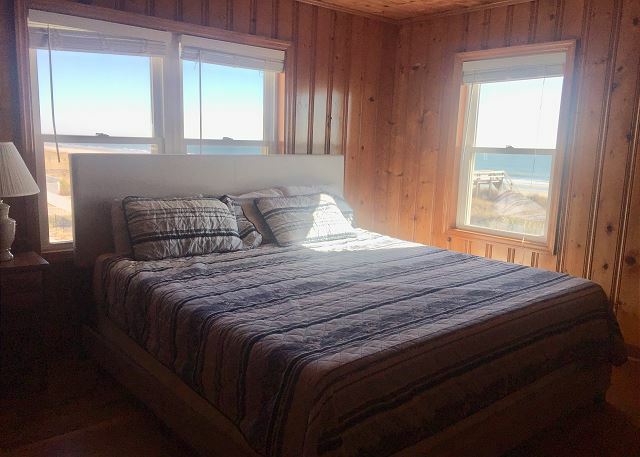 8 bedroom oceanfront house, sleeps up to 24 people! 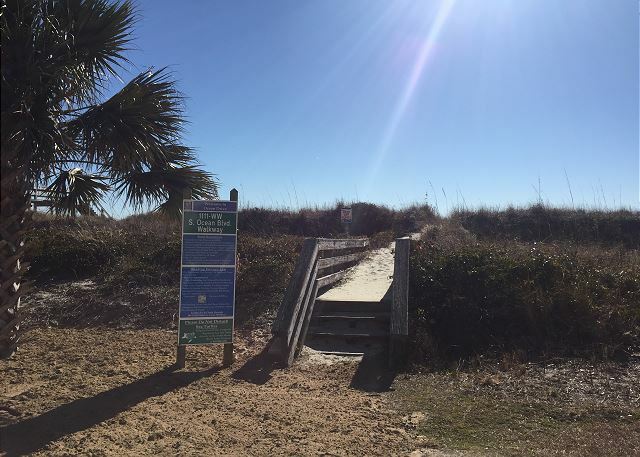 Walk right out to the beach from the Beach Access located downstairs. 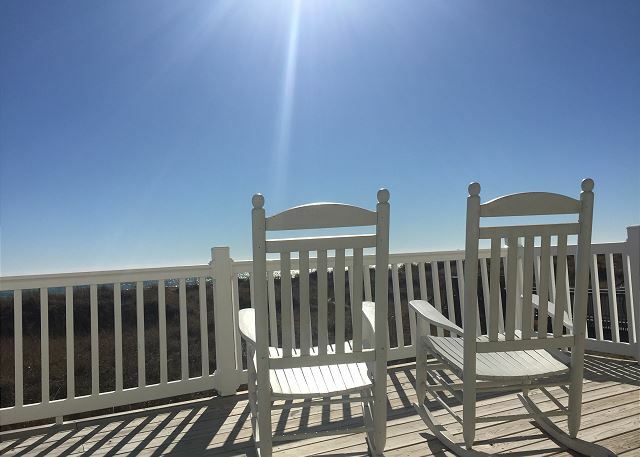 Enjoy Spectacular views of the Atlantic Ocean from your private deck. 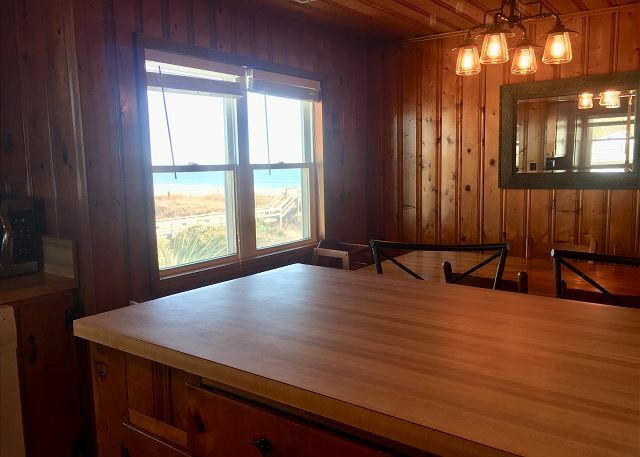 Plenty of deck space to gaze at the ocean! 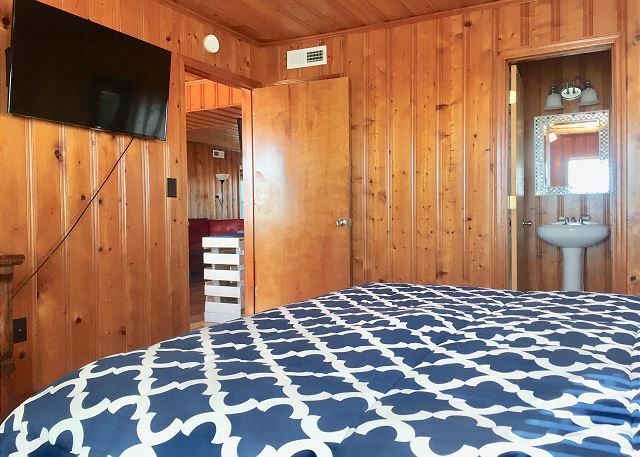 King Size bed in Master bedroom with Ocean views 55 inch Roku Smart TV with Spectrum Cable TV, Roku Apps (Amazon Prime, Hulu, Netflix (Requires your Subscription)) Free High Speed internet!! Have coffee and look at the ocean every morning. Master bedroom - 43" Roku Smart TV and attached restroom Main level bedroom #1 attached restroom with shower Guestroom with 2 Double Beds Guestroom with 2 Double Beds and attached half restroom Tub/ Shower Combination -All restrooms are completely renovated with new tile, fixtures, sinks, tubs, etc. Downstairs dining Room Guestroom has 2 full size beds- 43" Roku Smart TV Downstairs guest room with 2 full size beds and 43" Smart TV. 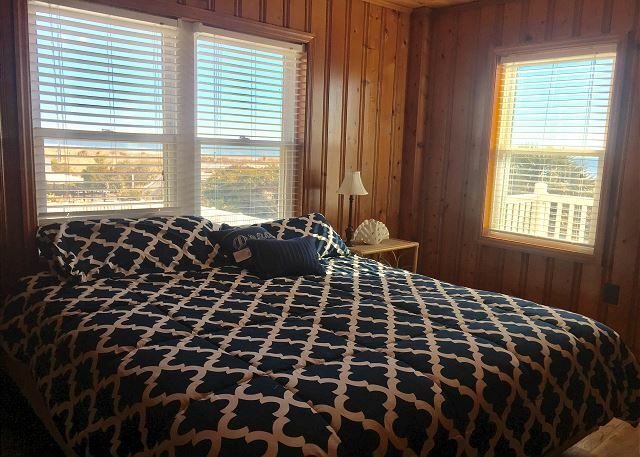 Guest room features 2 Full size beds, ocean views from the windows, and a 32" Smart TV. 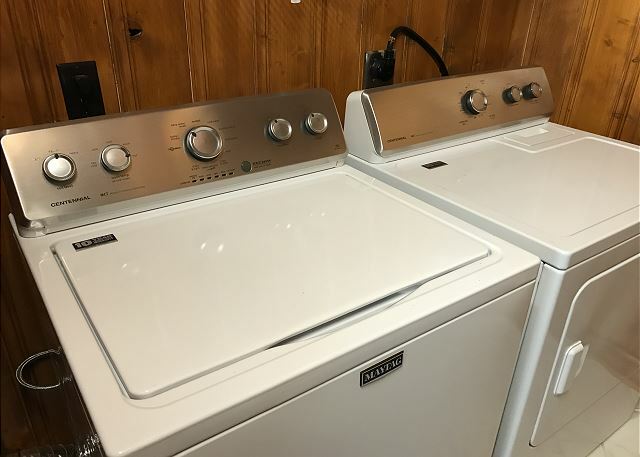 32" Smart TV Main level- Throw your beach towels and bathing suits into your Full Size washer/ dryer. 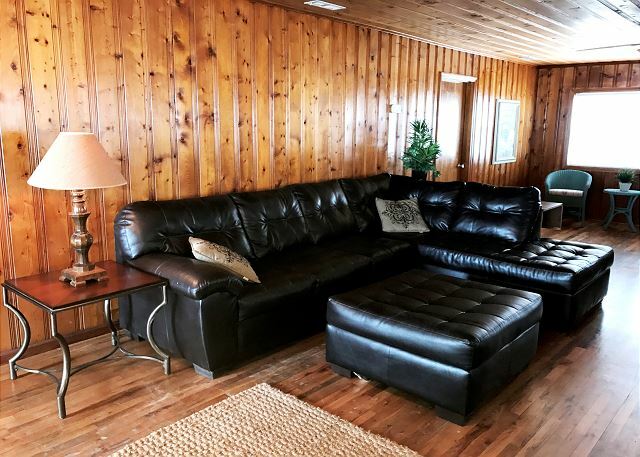 Spacious Upstairs Living Area with comfortable seating. 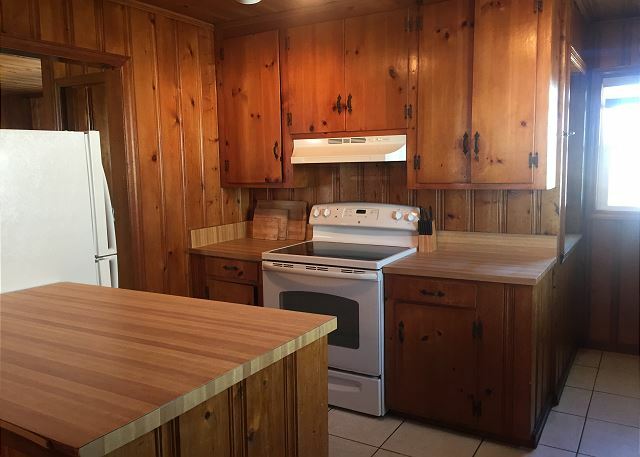 Kitchen is located upstairs with plenty of cooking utensils, pots, pans, cutlery, glassware, and serving dishes. 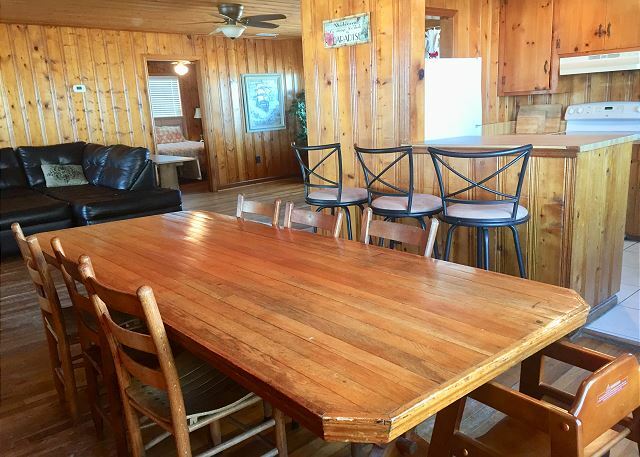 Fully Equipped Kitchen, prepare your beach snacks or family meals. Dining Room with seating for 6, a high chair, breakfast bar has seating for 3, and there is a dining room table downstairs. 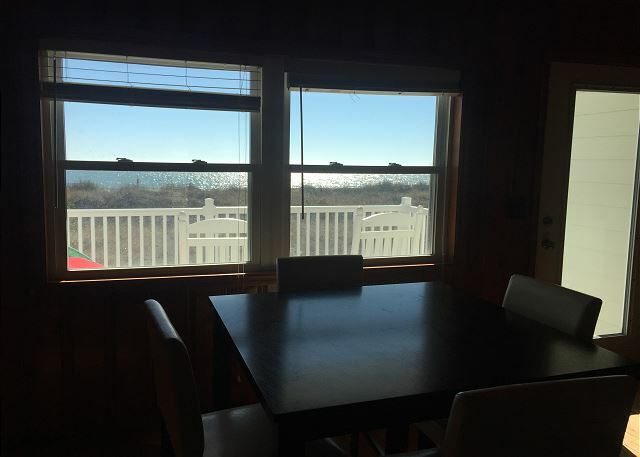 Ocean views from the Kitchen! Master bedroom with King Size bed, Smart TV and attached restroom Spectacular views from this bedroom 43" Roku Smart TV and attached restroom in the Master Bedroom Guestroom features a Queen size bed, Smart TV and attached restroom Guest room TV- 43" Roku Enabled Smart TV with Spectrum Cable. 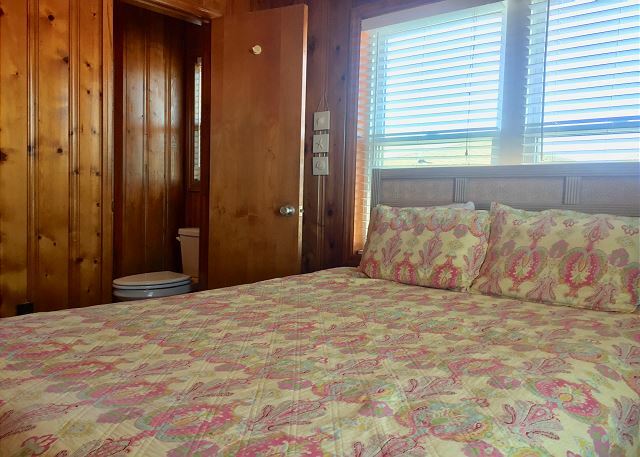 Guest room has an attached half restroom Relax with Ocean views from these classic Rattan Chairs. Very Spacious Living Area Upstairs as well. 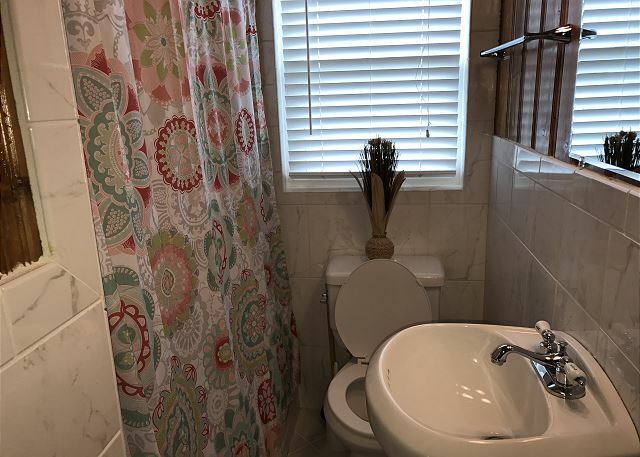 Free High Speed internet, 43" Roku Smart TV Queen size bed Upstairs Hallway restroom--All restrooms are completely renovated with new tile, fixtures, sinks, tubs, etc. 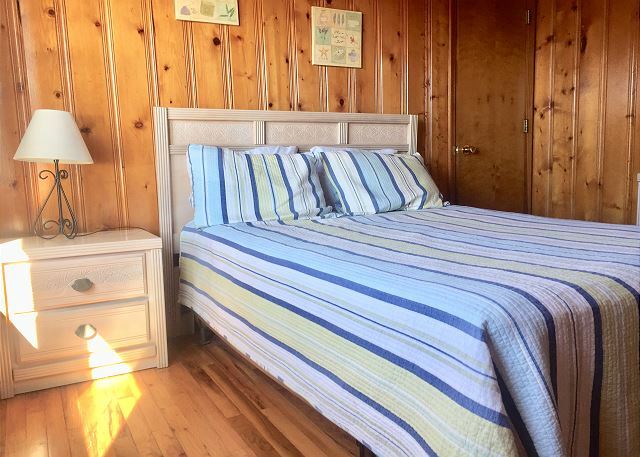 Guest room with 2 Double Beds, perfect for the kids! 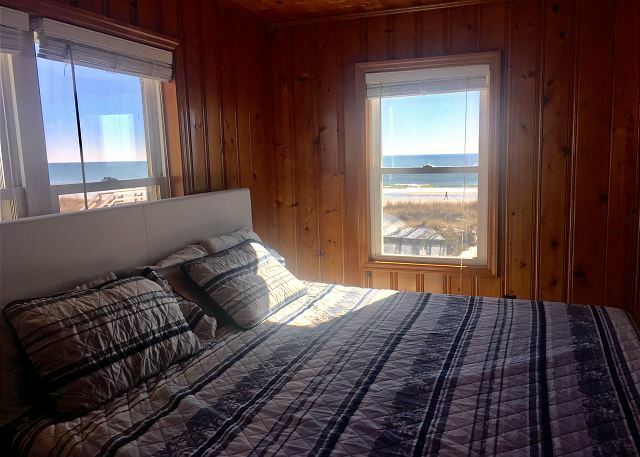 32" Smart TV Ocean Views from this guest room! 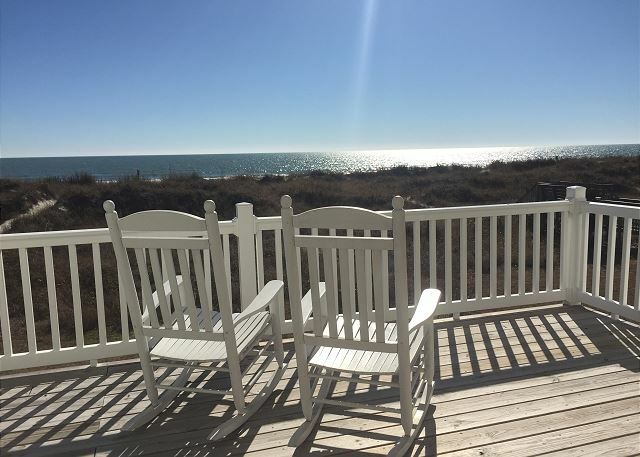 Take in the sun and sand @ Admirals Roost! Ample Space for entertaining and parking. 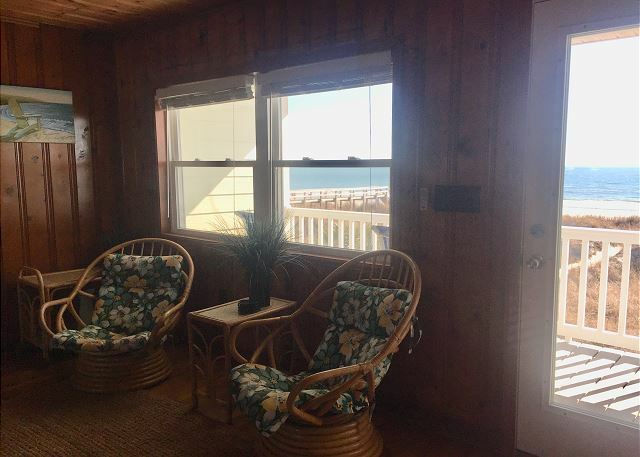 Plenty of deck space to gaze at the ocean at this Oceanfront House! Grab a glass of wine and watch the sunset over the ocean! 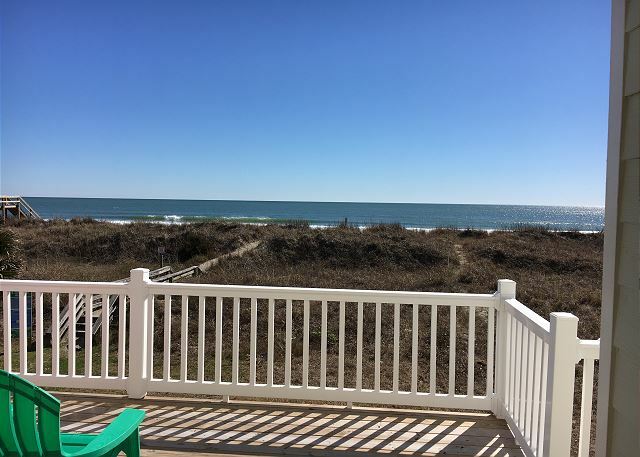 Listen to the waves crashing or relax and take in the sun from this oceanfront deck. 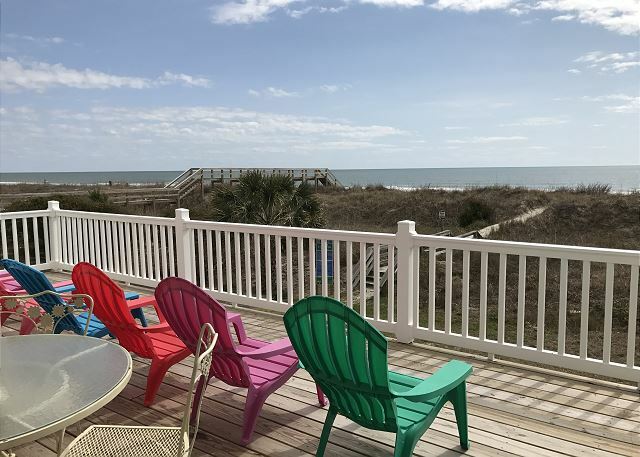 This beautiful oceanfront home has everything your need for a fun filled beach vacation! 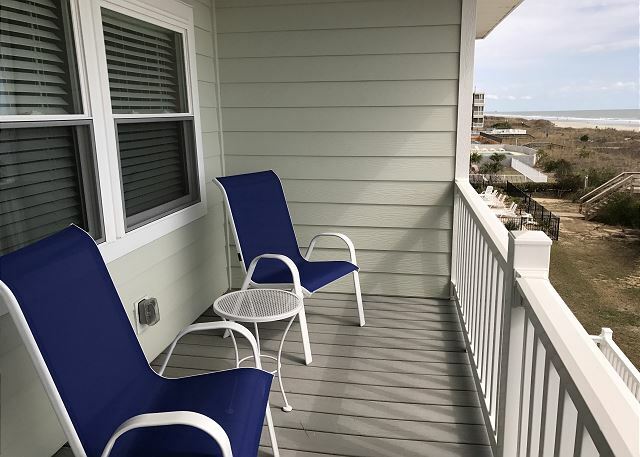 Enjoy beautiful ocean views and endless sunrises from one of the two oceanfront balconies. 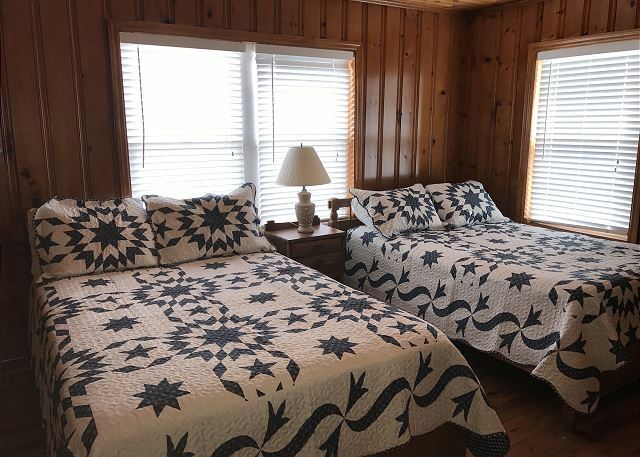 Admirals Roost features Eight bedrooms, 4 full & 2 half baths and can accommodate up to 24 people. 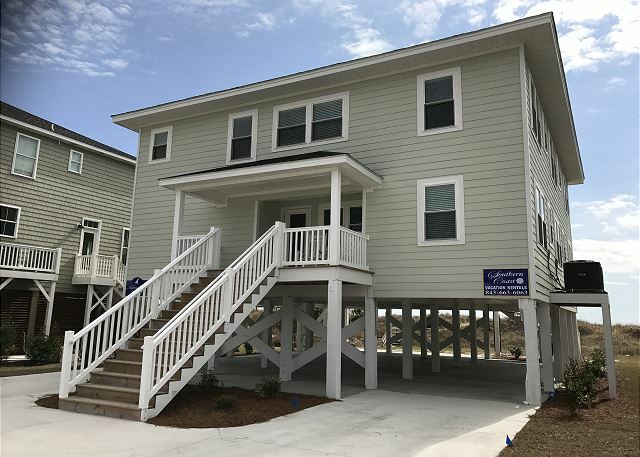 This North Myrtle Beach home offers Wireless Internet, Cable TV, and Smart televisions so you can enjoy Netflix, Hulu, or Amazon Prime. 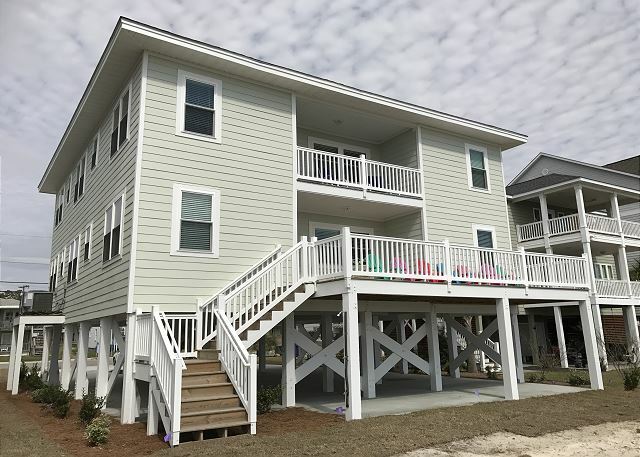 Admiral's Roost is a raised beach house located in the desirable Crescent Beach Section of North Myrtle Beach. The house was recently renovated with a complete exterior renovation. 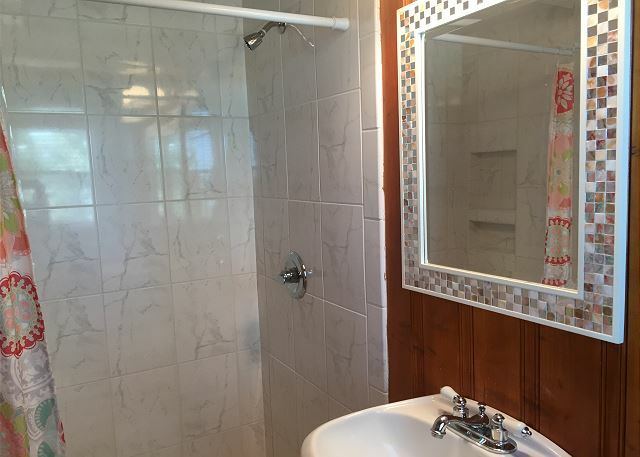 All restrooms were completely remodeled, new tile, bath tubs, showers, fixtures, vanities, etc. 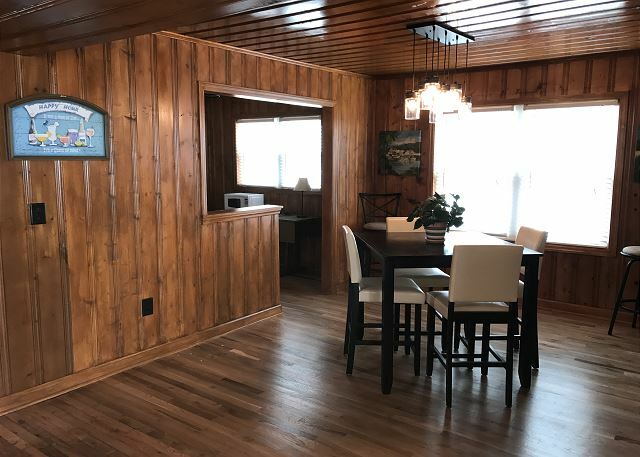 The nostalgic charm of a classic beach house was kept inside with newly stained hardwood floors and tongue and groove pine on the walls and ceiling. 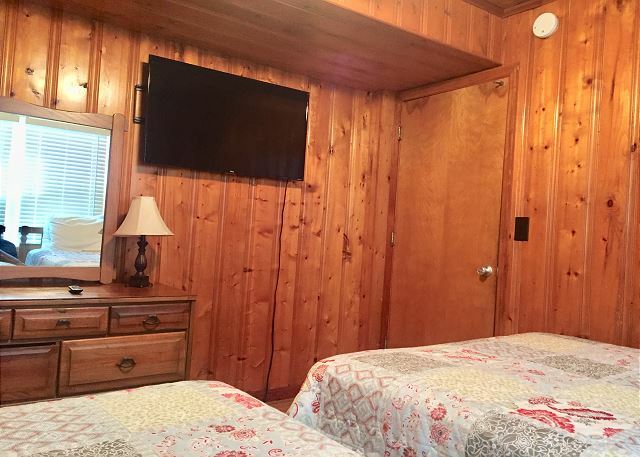 Each floor offers a spacious living area with a large flat screen Smart TV, four bedrooms, and two and one half restrooms. 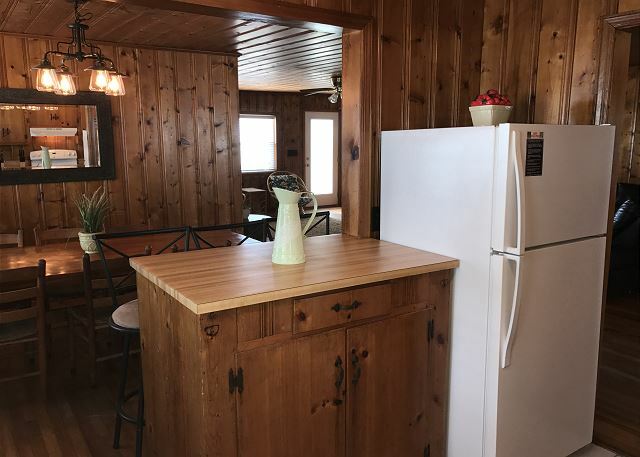 The superbly furnished kitchen is on the top floor and the laundry room is on the first floor. 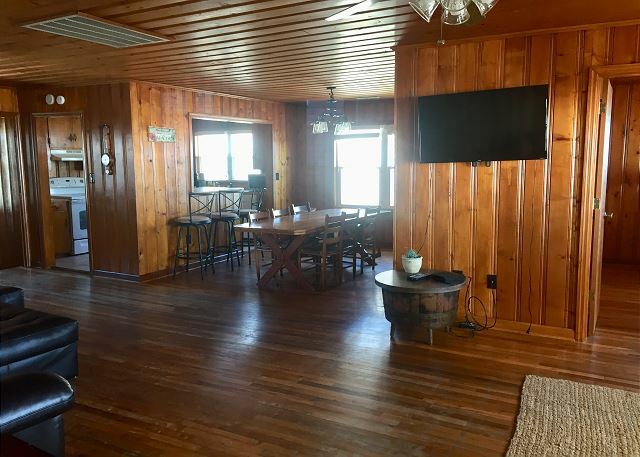 Spacious living area with 55" Smart TV with ample seating, dining room, a large oceanfront deck. 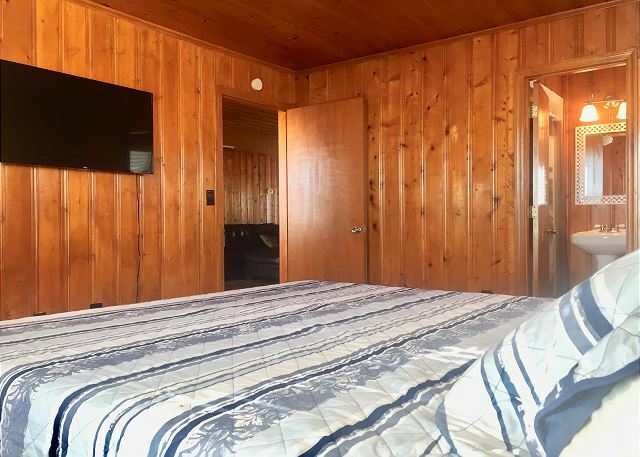 Guest Room - Two full size beds and a 32" Roku Enabled Smart TV. Fully equipped kitchen with everything you need to prepare a gourmet meal. Dining Room with seating for 6 and breakfast bar with seating for 3. 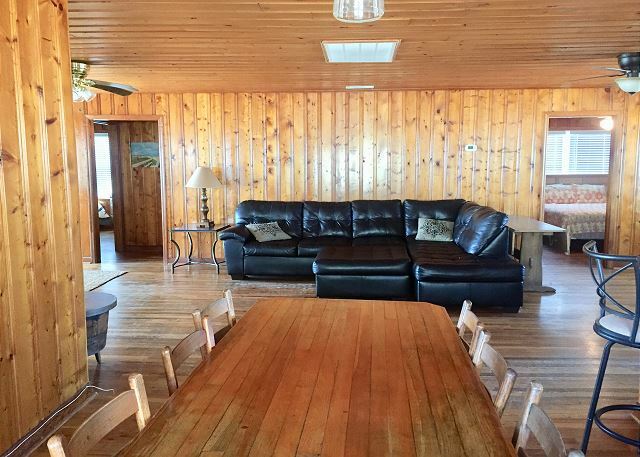 Spacious living area with 43" Smart TV and plenty of comfortable seating. Crescent Beach is conveniently located. 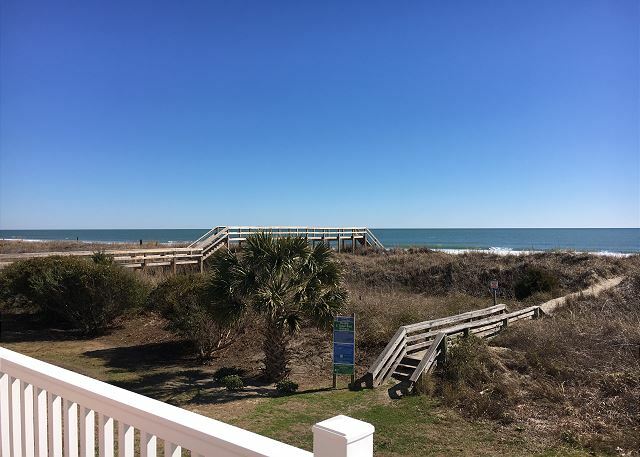 Enjoy a walk on the beach, go fishing, or have lunch while enjoying fantastic views! Take a short drive or walk to Main Street to enjoy local shopping, nightlife, and carnival rides in the summer. The Grand Strand has over 100 area golf courses, play a round of golf. Admirals Roost is fun for all ages. There is also a propane grill for your convenience. 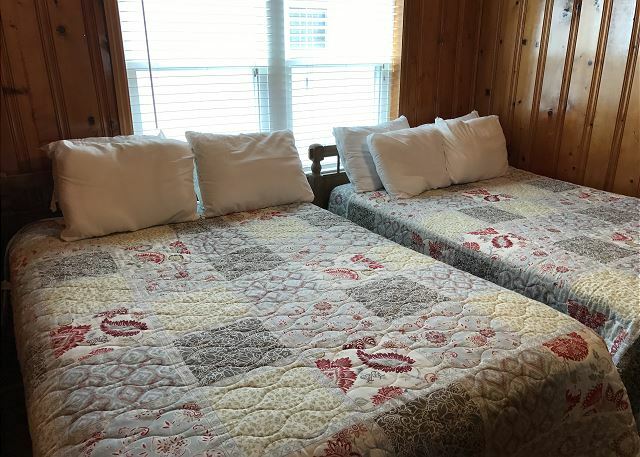 All linens and bath towels are included. 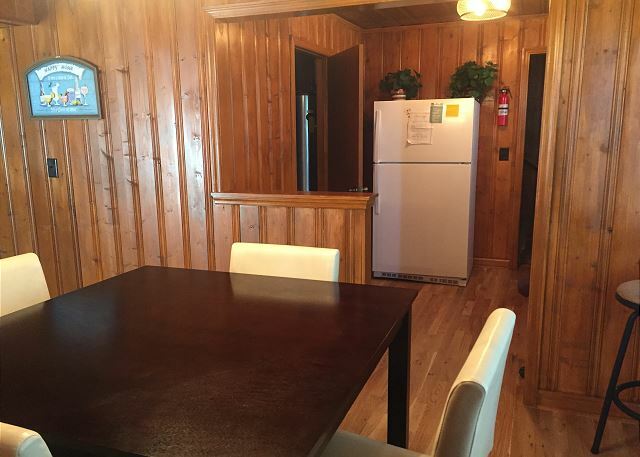 For your convenience, this home includes WiFi, a washer and dryer, and plenty of parking. Golf carts and their trailers are welcome,Sorry, motorcycles are not allowed. Admirals Roost was PERFECT for our family’s vacation. 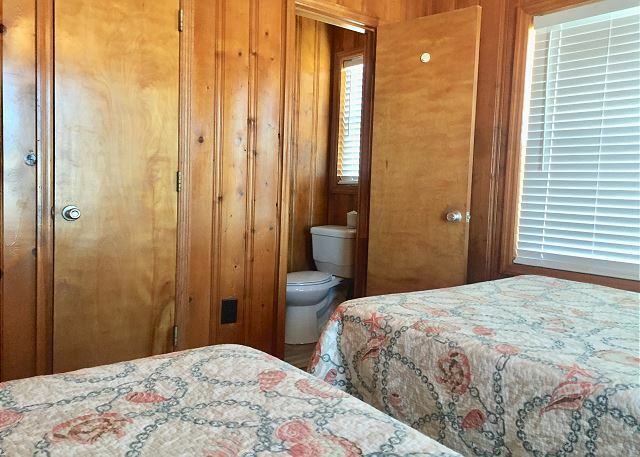 As with the other reviews, the bathrooms are small but not to the point that it would stop us from renting it again next year. 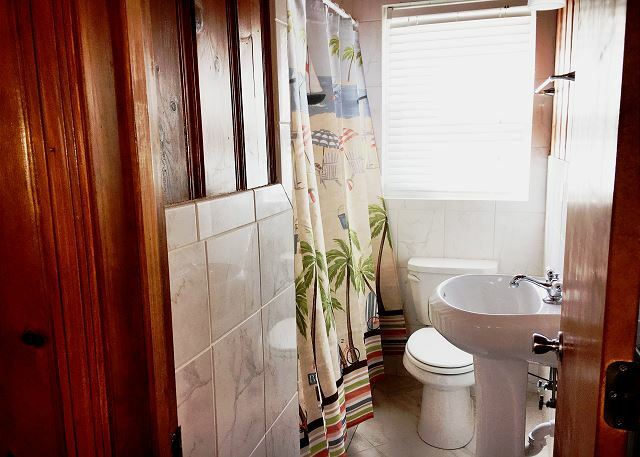 One suggestion on the bathrooms is to put a few shelves over the toilet so that you could keep your bathroom essentials in the bathroom. The upstairs king only had one night stand but we made it work by wheeling a table in from the living room. The location was awesome and the parking was a definite plus. Our family has already talked about renting it next summer. Property is a great building and location was exactly what we were looking for. The property was not as well maintained as we had hoped. The cleanliness wasn't what we thought it would be for this price point. The bed had bugs (NOT bed bugs) but bugs we had to dispose of and the sheets were stained. The floors were dirty (not sand), the grills were falling apart, and outdoor furniture was rusting and metal shards were on the decks. Refrigerators were spotless! If there were a few tweaks it would be an amazing property! We had 22 family members in this house for one week. It was probably the most fun I've had in many years. The property was perfect for us. However, this house needs 3 things for us to want to stay here again. 1. It badly needs an upgraded router. Our internet connection was troublesome and difficult at times. The router is outdated and very inadequate. 2. It would need more seating in both the upstairs and down stairs. 3. We must have a pool on our next vacation. 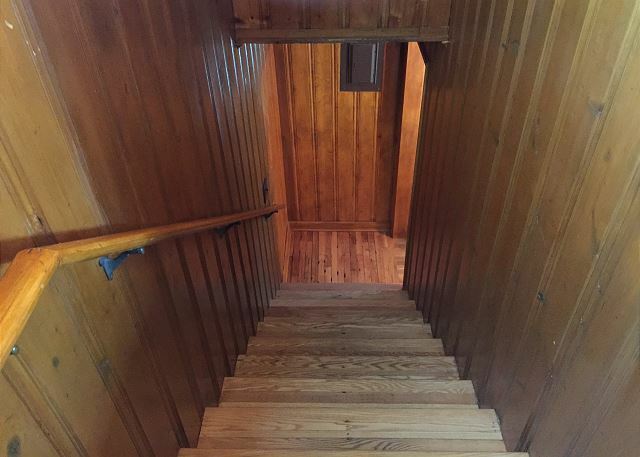 With theses 3 upgrades I could see our family renting this house repeatedly for years to come. Our family meets somewhere every two years. We have rented places up and down the east coast, but this was the first on the beach. It was Winter, but our family were delighted to have this place on the beach to enjoy our time together. 5 of the 17 even did a polar-bear swim. Burr...but fun! 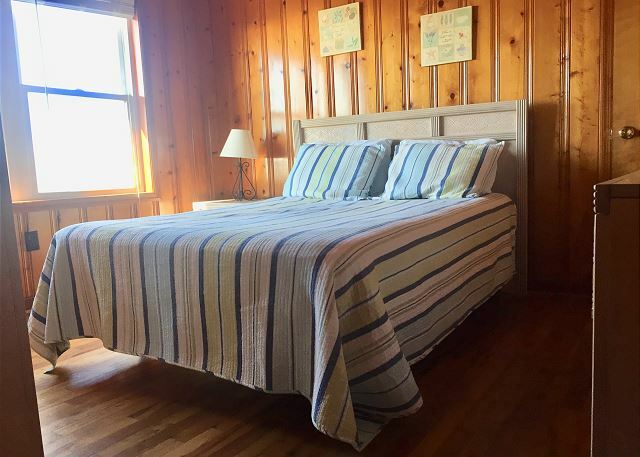 Clean and roomy, and just steps from the ocean. Nice floor plan. Great North MB location. Home was clean upon arrival and as described. The views were fantastic and access to the beach was right by the house. The lower ac unit in the home was not working as well as the upper unit but we choose not to have Southern Coast work on it at the time we were in it. 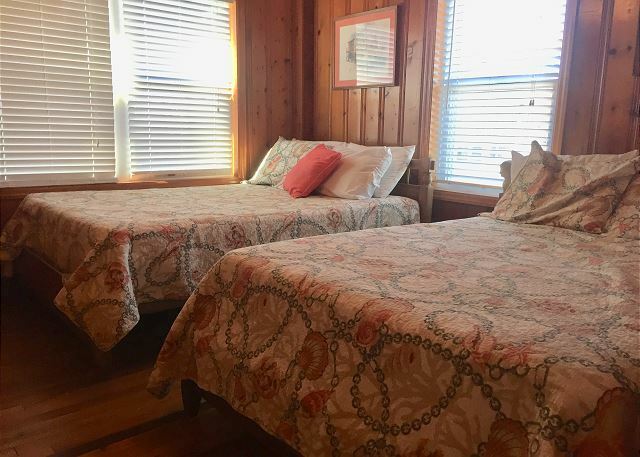 The only drawback for us was the bathrooms were very small and cramped and the master bedrooms did not have the cable hooked up in those areas (they had Roku as mentioned). The staff at Southern Coast was very helpful and right on the things we noticed upon arrival and fixed them immediately, except for the ac which we choose to wait on. 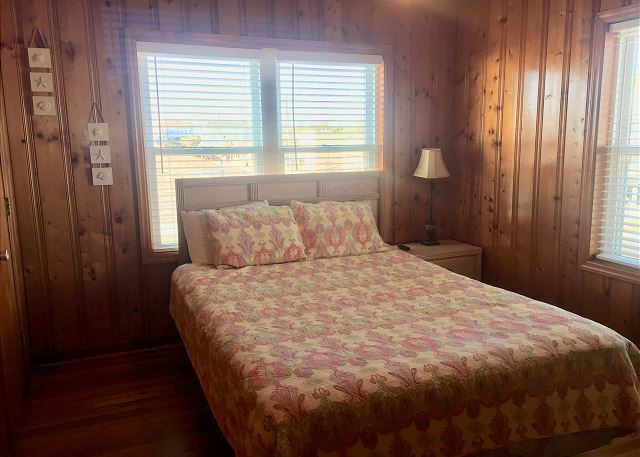 We would rent with Southern Coast Rentals again but would check their other properties and rent if we go back to North Myrtle Beach and if Admirals Roost is the only option left we would rent it again, just not first choice due to the bathrooms being on the small side. Activities we did was mostly on the beach were paddle ball, bocce ball, body surfing, skim boarding and we did go on the banana boat rides (which is a must) and played some different miniature putt putt games. We also visited a variety of restaurants and you must try Johnny D's Waffle & Bakery in Myrtle Beach and Dinos' House of Pancakes in North Myrtle Beach.... both were spot on in taste and quality/freshness of the food. We are pleased that you enjoyed our convenient location at a price that you could value! 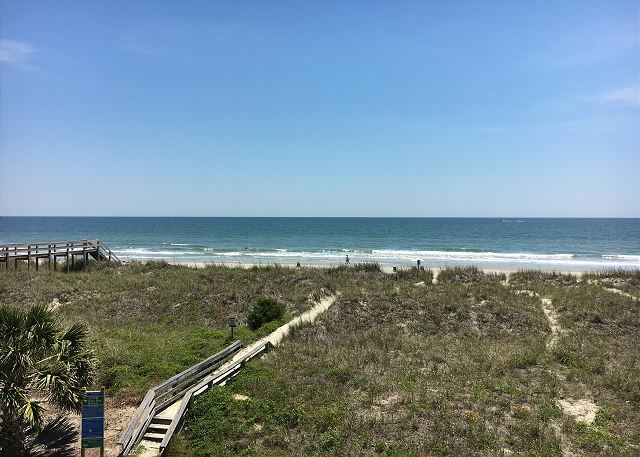 We hope that you had the time to see and do all that you wanted while Myrtle Beach! We regret that you experienced some issues with your cable TV and glad you gave a member of our staff the opportunity to assist you with them during your stay! The Roku TV does have the Spectrum cable App for all local channels on every TV. We will certainly have our maintenance staff look into the inconsistency with the downstairs air conditioning. Thanks so much for offering our future guests a great dining tip! We are grateful for your feedback and hope that you will back to see us again soon!